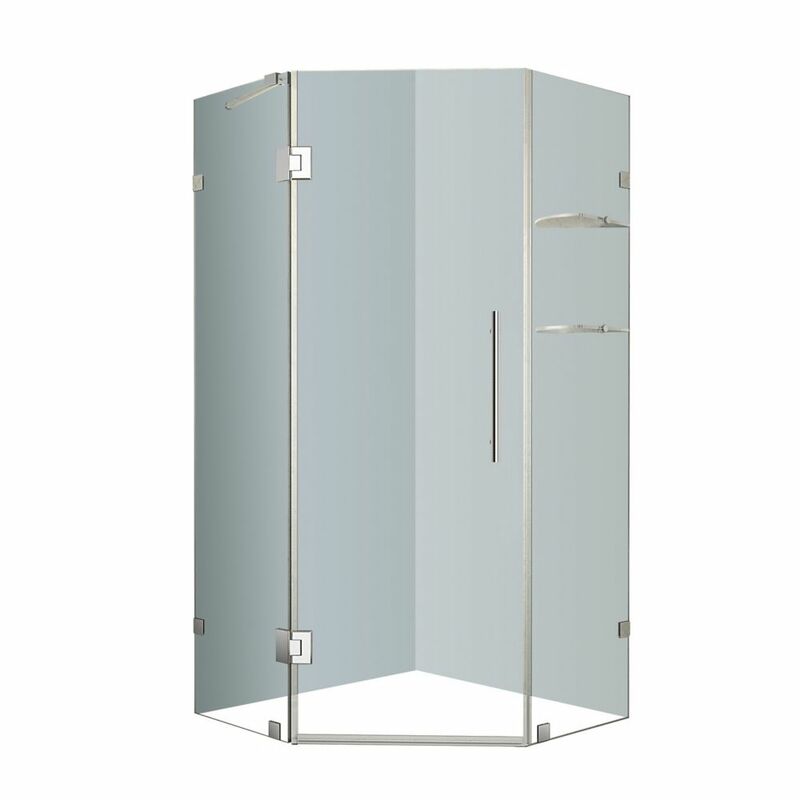 Neoscape 40-Inch x 40-Inch x 72-Inch Frameless Shower Stall with Glass Shelves in Stainless Steel Add a desirable contemporary style to your corner shower allotment with the Aston Neoscape GS completely frameless neo-angle shower enclosure with two-tier glass shelving. Available in a number of width and length sizes - from 34 in. to 42 in. - the Neoscape GS will instantly upgrade your bath. All models feature 10mm ANSI-certified clear tempered glass, stainless steel or chrome finish hardware, self-centering hinges,premium leak-seal clear strips and its reversably enginered for left or right hand installation. The GS class includes a two-tier glass shelving storage system, to complete your new showering experience. All models come with a 5 year warranty, standard; base not included. Neoscape 40-Inch x 40-Inch x 72-Inch Frameless Shower Stall with Glass Shelves in Stainless Steel is rated 4.0 out of 5 by 1. Rated 4 out of 5 by nicolemarie from Beautiful Design These are a beautiful design. They are very clean and sharp looking. I wish they were a little taller, but overall they look really nice. I had my handyman install the doors and he mentioned they were not the easiest to install; however, he was installing them to very thick marble. This probably didn't make it easier. NOTE: Careful when you order them and how you install them though. My shower base is a 42x42 but after hanging 1/2 backboard and 1/2 marble the 42x42 enclosure I originally ordered was too big. I had to return it and order the 40x40. In the future, I would try looking at the exact measurements of the side walls and door before ordering.